Register for the 2012 Conference and be Entered to Win! Registration for the 2012 Agri-Marketing Conference is now open. Make plans to join NAMA, April 18-20, 2012, for the Agri-Marketing Conference in Kansas City. Register for the conference by December 31 to be entered to win a $200 Apple Gift Certificate. To register for the conference, visit http://www.nama.org/ConferenceRegistration/Default.aspx?confid=38. Check out the keynote speakers for the conference below. How do you turn good ideas into action that influences customer behavior and accelerates the buying process? How do you grab market share and stay relevant to your clients and customers for years to come? What are the simple tools you need to rebound from setbacks stronger than ever? Join NAMA for the 2012 Agri-Marketing Conference and get the answers to these pressing questions and more! Do some mental spring cleaning with us in April. Recharge and return to the office with the innovations that will set you and your company apart in the year ahead. This year’s keynote speakers are going to flip your thinking and challenge you to ask yourself the tough questions that will set you apart from the pack. Learn to identify and amplify your unique strengths to focus, stay on track and deliver remarkable results. The 2012 Conference is just the right mix of marketing leadership and development … and tactical, strategic breakouts to arm you with action plans you can use immediately. If the only way to get to Carnegie Hall is to practice, practice, practice … then the only way to make it happen is to execute, execute, execute. The world isn’t short of new ideas. It’s short of people with the ability to turn these good ideas into reality. “Making it Happen” will bring it back and outline the five competencies you must master to execute new ideas and create change. Breakthroughs in neuroscience have shed new light and given us a much greater insight into how people buy and what drives their behavior. And these very drives are changing right before our eyes. As a result, the way we sell our services and position the value we bring must change too. • Package your idea as a saleable commercial offer. • Align your offer to a compelling market need. • Influence a buyer to not only want what you have, but want it from you. • Quickly accelerate your progress through leverage, scale and platform. • Re-invent yourself and open up whole new areas of opportunity for you and your business. Peter’s outstanding achievements were first officially recognized in 2003 when he was named Young Entrepreneur of the Year in his home state. Seen as a global thought leader, Peter’s insights into business trends and the changing needs of customers and staff make him a regular presenter on Fox Business, as well as appearing on ABC and the BBC. In 2008 Peter was a featured expert in a five-part global series on Innovation on CNBC, and he’s been written up in the Washington Post and Fast Company. We all saw globally recognized brands shrink or die during the recession. 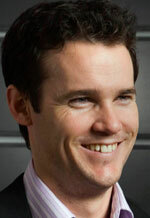 Conversely, we witnessed young, nimble companies swoop in to dominate market share. Could that happen to you? Ross dissects the reasons for the staggering success stories—and he pinpoints the warning signs that were ignored by those who failed. Remaining relevant (to your customers and team members) is the ONLY way to substantially grow your organization during a recovery. If you’re relevant, you can take market share away from your competition. But it won’t be easy. You will have to accelerate your “A” game to earn that market share. And, you will have to re-double your efforts to retain the base you already have. • Ross will coach you on how to make sure you continue to be important to the people who are paying to keep you alive. • Learn to be consistently aware, empathetic, and urgent so you can retain your current customer base…while you are wrangling customers away from your competitors. • Get an exclusive peek inside the thriving organizations that consider innovation (and change) their reason for living. You’ll walk away from this seminar ready to use the talents you already have, to dig a little deeper, to honestly evaluate yourself—and then to achieve everything you want and more! Tap into the energy you need to knock down any obstacles that have been standing in your way. Throughout grade school and high school, Walter aimed at nothing less than being the best student-athlete he could be. 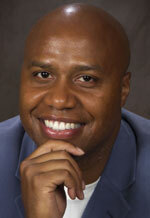 He studied hard and practiced day in and day out on the basketball court in his backyard. With the guidance of his father and his high school coach, Walter Bond won a coveted spot on the Illinois All-State team in his senior year. He earned a basketball scholarship to the University of Minnesota. Because his new teammates were bigger, stronger and more competitive, he had to reach inside and work even harder in order to advance his skills to the next level. His strong will, his ability to motivate his teammates (while keeping them laughing) and his can-do attitude helped him become a nationally recognized college player. By the beginning of his senior year Walter was known as the top sixth man in the NCAA. Even though he suffered a broken foot not once but twice during his senior year, Walter Bond refused to give up on his dreams. After graduating from the University of Minnesota with a BA in Communications, he worked tirelessly at his game and landed a position on the Wichita Falls Texans, a team in the Continental Basketball Association (CBA), the developmental league for the NBA. He made a remarkable comeback and finished the year stronger, quicker and more determined than ever. After Walter made the all-rookie CBA team, his reputation as a talented and exceptionally hard-working guard spread like wildfire throughout the NBA. He was invited to a number of free agent camps and was signed to play with the Mavericks. Walter, the young man who never, ever gave up on his dreams, went on to have an eight-year professional basketball career, playing alongside such NBA greats as Karl Malone and John Stockton as a guard for the Utah Jazz and the Detroit Pistons. Walter Bond became the first rookie free agent ever to start opening night. He’ll show you how to harness the power of accountability to become an agri-marketing rock star. For more information on the 2012 Agri-Marketing Conference, visit www.nama.org/amc. Regional and chapter Best of NAMA Awards events will be taking place in January and February. We know you won’t want to miss these fun events, so we’re providing the various dates so you can add as many as you’d like to your calendar and easily register for more than one. February 14, 2012 – Region I (Desert Southwest and Western Pacific Chapters) in the Wine and Cheese Pavilion (Corner of “S” Street & Expo Lane/by Seminar Center) at the World Ag Expo, Tulare, CA, with a reception scheduled to start at 11:00 am. January 12, 2012 – Region II (Gateway, Great Plains, Midlands, Missouri-Kansas, Rocky Mountain, and Southwest Chapters) at Boulevard Brewing Company, 2501 Southwest Boulevard, Kansas City, MO 64108, beginning at 6:00 pm. For more details, visit http://www.nama.org/amc/bon/region2.htm. You can also register online at http://www.nama.org/ConferenceRegistration/Default.aspx?confid=39. A note, too, that sleeping rooms are available at The Westin Crown Center Kansas City. Due to a city-wide event, the cut-off date for those rooms is December 22 – so don’t delay if you want a room. For reservations, call 1-888-627-8538 or, to reserve a room online, go to NAMA Room Block. January 26, 2012 – Region III (Cornbelt, Iowa, North Central, and Northern Prairie Chapters) at the Walker Art Center, 1750 Hennepin Avenue, Minneapolis, MN 55403, starting at 6:00 pm. For more details, visit http://www.nama.org/amc/bon/region3.htm. Online registration for the banquet is available at http://www.nama.org/ConferenceRegistration/Default.aspx?confid=40. A block of rooms has been secured at the Hyatt Regency Minneapolis, 1300 Nicollet Mall, Minneapolis, MN 55403. To book a room, call 1-888-421-1442 or, to register online, click on the following link: https://resweb.passkey.com/Resweb.do?mode=welcome_ei_new&eventID=8116620. Make sure you mention NAMA to receive the $120 rate. The hotel cutoff is January 12. January 19, 2012 – Region IV (Badger, Chicago, Heartland, and Mid-America Chapters) at the Crowne Plaza Madison, 4402 East Washington Avenue, Madison, WI 53704 starting at 6:00 pm. For more details, visit http://www.nama.org/amc/bon/region4.htm. Online registration for the banquet is available at http://www.nama.org/ConferenceRegistration/Default.aspx?confid=41. A block of rooms has been secured at the Crowne Plaza Madison. To book a room, call 1-888-233-9527 or, to reserve a room online, go to https://resweb.passkey.com/Resweb.do?mode=welcome_ei_new&eventID=7906469. Make sure you mention NAMA to receive the $99 discount rate. The hotel cutoff is January 11, so if you need a room be sure to make a reservation quickly. January 24, 2012 – Carolinas/Virginia Chapter at Mez Contemporary Mexican, 5410 Page Road, Durham, NC 27703, starting at 5:30 pm. Online registration for the banquet is available at http://www.nama.org/store/index.php?p=catalog&parent=16&pg=1. For more details, contact Mary Cameron (mcameron@gibbs-soell.com), Lela Griffin (lgriffin@gibbs-soell.com) or Jennifer Gwyn (Jennifer.gwyn@sscoop.com). A Midsouth Chapter event will be planned and further details will be forthcoming. January 25, 2012 – Southeastern Chapter at The Norcross Station Café, 40 South Peachtree Street, Norcross, GA 30017, starting at 6:00 pm. Online registration for the banquet is available at http://www.nama.org/store/index.php?p=catalog&parent=20&pg=1. For more details, contact Kim Maloney (kmaloney@freebairn.com). If you have any questions, don’t hesitate to contact us at 913-491-6500. The deadline for submitting nominations for the Agribusiness Leader and NAMA Marketer of the Year awards is January 20, 2012. These awards will presented at the 2012 Agri-Marketing Conference, April 18-20, 2012, in Kansas City. NAMA will recognize an active member with senior management of marketing and/or sales responsibilities with the NAMA Marketer of the Year award. This award is the most prestigious honor awarded to an active member of the association and honors outstanding accomplishments in the field of agri-marketing. Nominees are solicited from agribusiness and related companies with overall marketing and/or sales responsibilities. Nominees must be NAMA members. To nominate someone for the NAMA Marketer award, download the application in an Adobe .pdf format at http://www.nama.org/awards/mktrapplication.pdf or fill out the online application at http://www.nama.org/awards/namamarketerform.htm. Stephanie Liska Beck Ag, Inc. The Agribusiness Leader of the Year award recognizes leadership achievement in agriculture and the food and fiber industry. This award is for agribusiness leaders and leaders in private, public or academic service. Nominees do not have to be NAMA members. The Agribusiness Leader of the Year award is NAMA’s highest honor. The award honors an outstanding leader in agribusiness, education, government service or other agribusiness related area. Solicited from senior level position holders in private, public or academic service, nominees should exemplify excellence in agribusiness by their significant contributions to the industry. To nominate someone for the Agribusiness Leader of the Year award, download the application in an Adobe .pdf format at http://www.nama.org/awards/agbusapplication.pdf or fill out the online application at http://www.nama.org/awards/agribusinessform.htm. Dave Seehusen Land O’Lakes, Inc.
H.D. “Harry” Cleberg Farmland Industries, Inc.
Robert Wichmann Pioneer Hi-Bred Intl., Inc.
Gary Parker Lindsay Manufacturing Co.
Nicholas Babson Babson Brothers Co.
David Garst Garst Seed Co.
Dr. Kenneth Bader American Soybean Assn. Owen Newlin Pioneer Hi-Bred Intl., Inc.
Robert Book Elanco Animal Products/Eli Lily Co.
Donald Fritz Farmers Hybrid Co.
Del Walker Funk Brother Seeds, Co.
George Varnes Eli Lily Co. There are many different sponsorships available. Companies with marketing budgets of all sizes can participate. 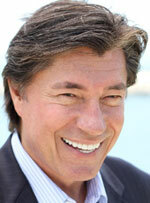 The higher your support, the more benefits you’ll receive….Sustaining Partner, Platinum, Gold, Silver or Bronze. In addition, you can get more company visibility by claiming one or more of the sponsorship opportunities. These opportunities are available on a first come, first serve basis, with first right given to last year’s sponsor. Please review the benefits and opportunities of sponsorship at the 2012 Agri-Marketing Conference and confirm your interest to Jenny Pickett at (913) 491-6500 or email to jennyp@nama.org or fill out the online sponsorship form at http://www.nama.org/amc/sponsor/form.htm. In-kind sponsorships, e.g., printing, can be considered. Investing in the Century Club provides the opportunity to step forward and help advance the future of agribusiness. Today’s youth are tomorrow’s leaders and the Century Club support is totally dedicated for investing in scholarships for tomorrow’s leaders. Club members who renew prior to the Agri-Marketing Conference will have an “ABEF Century Club” sticker on their name badge and be recognized on the Century Club sign in the Silent Auction area and in other conference materials. You will also receive an invitation to attend the Agribusiness Leader of the Year Recognition Luncheon hosted by the ABEF. The annual membership contribution is $100. You can be a part of this select group of individuals committed to enhancing the opportunity for tomorrow’s leaders. Don’t be left out, sign yourself up now! Visit http://www.nama.org/store/index.php?p=catalog&parent=6&pg=1. Although agriculture is a bright spot in the U.S. economy, it will face serious challenges in the next 40 years. Perhaps the greatest of these is population growth, which is why members of the North Central NAMA chapter met in November to get a clearer understanding of what it will take to keep the world fed through 2050. First, he said, agriculture needs to meet the current demands. There are seven billion people on the planet today, one billion of which are hungry. Second, agriculture must meet future demands, as the population is projected to skyrocket to nine billion by 2050. And lastly, agriculture must find a way to become truly sustainable. 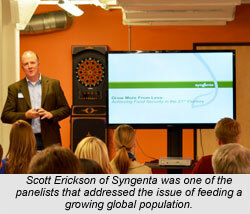 West’s presentation was followed by Scott Erickson, Soybean Portfolio Manager at Syngenta. Providing a corporate view of agriculture, Erickson agreed that high water consumption and tackling efficiency are serious issues that need to be addressed. He noted that growers need to leverage the genetic potential of the field and focus on the technologies that will increase crop yields. Tina Charpentier, Director at Padilla Speer Beardsley, added a more consumer-focused perspective to the discussion. She noted that some of the image struggles agriculture is facing in the consumer environment is the result of unclear storytelling. All audiences – including consumers, employees, suppliers, legislators and regulators – need to be aware of how hard the agriculture industry is actually working to provide quality food while still preserving the environment, Charpentier said. Later, in a question-and-answer session, each of the speakers dove deeper into the complex issues of the economic demand for food and the basic need for food – in particular, how sustainability and marketing messages can be focused to reach agriculture and consumer audiences alike. Although farmers and consumers are sometimes different audiences, the speakers agreed, they do share a single goal: Keeping the world alive. 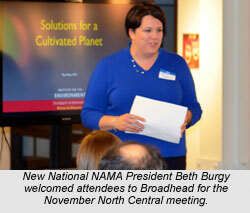 The November Iowa NAMA meeting was held at the FFA Enrichment Center in Ankeny, IA on November 18. 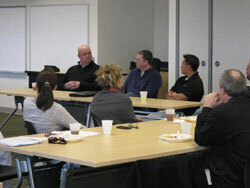 The meeting featured a panel discussion focusing on how the creative process works to help meet communications goals. The panel discussion led to great questions and conversation from both the audience and the panelists. We would like to thank our panel members – Drew Jones of Two Rivers, Dana Scheidegger of McCormick Company, and Chris Hanson of Lessing Flynn – for taking the time to share their knowledge and experience and answer our questions. The NAMA Staff wishes you all a happy and safe holiday season. The NAMA office will close at Noon on December 23 and will re-open on January 3. But don’t worry, if you need to get a hold of us, just shoot us an email and we’ll respond ASAP.